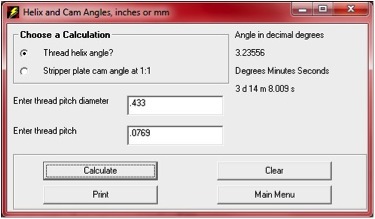 Here you can calculate the helix angle of a thread if you know the pitch diameter and the thread pitch. Technically, the thread’s pitch diameter occurs at the diameter where the male and female thread forms are equal width. Some companies incorrectly use a diameter that is half way between the major and minor diameters, and in most cases, this is close enough for machining.